Well, the rally has ended and there are some really interesting results from this year’s Myrtle Beach Fall event. First and foremost, a lot of riders skirted the city limits of Myrtle Beach all together. Attendence in town was certainly down, vendors were down, and a lot of local businesses lost the biker’s dollars. I believe this had as much, if not more to do with the 15 new laws to curb the bikers vacation as it did the economy and gas prices. 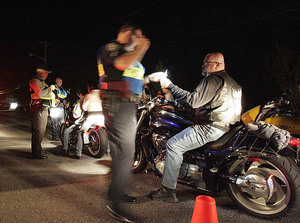 Within the city limits, there were only three tickets issued for sound violations. It seems the cops were giving the bikers a bit of a grace period and issuing a lot of warnings, but not handing out violations. It has also been reported by the Myrtle Beach Police Department that there were a total of 17 complaints about sound. This statistic does not tell us whether the complaints were about bikes, cars, trucks, music, or other possible sound nuisances. Speaking of stolen motorcycles, there was a bust of a chop shop in nearby Andrews. The three men arrested included Martin Grice, a jailer at the Georgetown County Jail, and Patrick Cumbee, an Andrew’s Police Officer. The third man, Dedrick McCray, must have been the misfit of the bunch as he wasn’t involved in law enforcement at all. All in all, the rally commenced and those that attended had a good time. It is our hope that the MB City Council relaxes a bit and lets the bikers come for a good time. You and I know that although we all love a good party, we are a good bunch, right? As of now, there are three lawsuits against the city in an attempt to prove the new laws unconstitutional. This entry was posted on October 11, 2008 at 9:30 AM and is filed under Custom Bike Show, Motorcycle Rally, Uncategorized with tags arrests, chop shop, myrtle beach, police, statistics. You can follow any responses to this entry through the RSS 2.0 feed. You can leave a response, or trackback from your own site.